WHY ARE WE DIFFERENT FROM OTHERS ? Have you ever wondered why so many luxury car rental companies don't offer their address, just leaving mobile phone number for delivery instead? The reason is simple, it's because they don't have one! Our offices instead have a physical location, furniture and a secretary (it may seem obvious, but it's not ) . When they're not rented, our cars are either under maintenance at the workshop of the car dealer we bought them from, or in our garage! We will always be happy and proud to show you our fleet and offices whenever you want. We are a real company, with a real rental license, real cars, real employees and real services. We're not brokers or an agency acting as charterers, offering you cars and services it doesn't even know. Most importantly, we have our own regularly registered car fleet for "RENTAL USE WITHOUT DRIVER", which means that whenever you request a car from us, we will know exactly what we are giving you, in what conditions it is and its whereabouts, and you will therefore get an easy and prompt answer to your availability requests. Every photo we post on our website is exactly a picture of the car we are offering you, the very same you will eventually drive. We deeply value honesty and ethics, because we know that reputation is actually the best marketing tool. 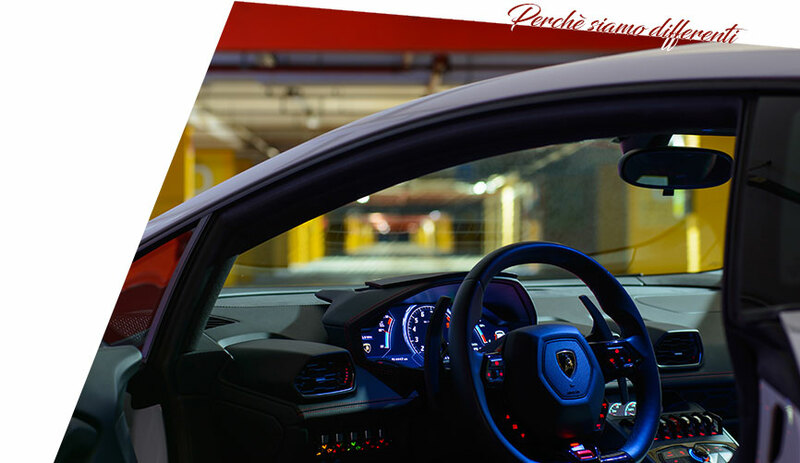 We have decided to impose ourselves in this market in order to become the first choice for all those looking for luxury cars, and a service of equal prestige. Our primary objective is not earning no matter what, it is satisfying you completely, something which will give our brand inestimable value over time. This is why we are different from the many exploiters ready to spill money from you as soon as they get a chance to do so. We know that unexpected events cannot be totally excluded. It could be accident, or simple tangential traffic resulting in a delivery delay, or rather, it could be due to us with an employee who may eventually get sick or a car breaking. From Suv to Performance vehicles, from Cabriolets to flagships, 2, 5 and also 7 seaters... We know there could be many reasons behind your need for a car, which is why we figured that the best thing we could give you is a car fleet capable of satisfying you in any occasion. You can easily find the most fitting car for your needs, by easily filtering out your requirements. Each model is accompanied by a thorough description of its technical specs and optionals with which it is actually equipped. We know you may not always want to spend for driving what could be the latest Lamborghini model, worth 350,000 Euros. For this reason, we have expanded our fleet by also including entry level models, always and only belonging to the most prestigious brands, such as Porsche, Ferrari, Aston Martin just to name a few, and always equipped with the best optionals and technical specifications . You really will be spoiled for choice, and we will be happy to assist you and recommend the right model for your rental . For us, excellence means perfection, and our cars play a crucial role in this sense. Our fleet is constantly renewed, our cars get replaced every 24/30 months on average, or before reaching 40,000 km of travelled distance, for the benefit of performance, safety and reliability. A crucial part of our work is selecting only the best models for you, and for this, every new purchase is made after a rigorous consultation process between our partners and the official dealers of the most prestigious brands, in order to anticipate fashions and trends and always have models which are the most requested by the market. Basically, we always choose cars with the best technical requirements in terms of innovation, performance and safety. After that, we meticulously configure it without leaving anything to chance, from color to type of vehicle, to all those aesthetic options which will make it even more appealing, such as latest generation LED headlights and oversized rims. Your safety and satisfaction are the center of our interests, which is why our cars always get constant maintenance work. During the purchase phase, we assess the vehicle's maintenance program with the official workshop of the dealer we purchased it from, specifically designing it for that car type. Besides bodywork and engine maintenance as a proof of always higher reliability and performance standards, we always have meticulous care for aesthetics . From perfect polishing and removal of every small scratch on rims and body, to cleaning, sanitation and perfuming of the interiors . We are proud of our car fleet, and it is in our best interest to make sure you'll always find our cars in perfect condition ! It is our intention to provide you with a service of excellence, and for this we always put quality first. We willingly chose to dedicate ourselves to less Customers, in order to provide you exactly with the same levels of care and attention to details we always brag about. Our prestigious car fleet, our wide range of services and the expertise we acquired over the years allow us to study the best possible solutions for fulfilling all your requests. Your dedicated, qualified and competent consultant will be committed to giving you proposals studied in detail and based on your actual needs. It would be fantastic to own all car models, from all famous manufacturers, perhaps even more than one, and in all kinds of colours. Sadly enough, this is not possible ... But thanks to our 10 years of experience we have chosen only a few partnerships, and only with colleagues we have previously tested, in order to get cars which comply with our own quality standards. Thus, don't panic if your dream car isn't on our website, we're pretty sure we'll be able to get it for you! You won't have to worry about anything, we will always be the ones renting the car to you, service quality will remain unchanged and it will always be impeccable.